By John Macdiarmid, Highland and Agricultural Society's Office. Happily the weather remained favourable, and all Sunday the ship lay as still as if in harbour. I made myself the guest of the minister on Saturday night. There were three services on Sunday—at 11 a.m., 2 and 6 p.m. conducted in the same form as in other Free Churches. Attended the forenoon service, along with several of the ship's officers, and counted 66 of the natives present—21 men, 35 women, and 10 children. At the close of the service the men all sat down and allowed the women to depart first. All were decently and rather cleanly clad. The men wore jackets and vests of their own making, mostly of blue colour, woollen shirts, a few had linen collars, and the remainder cravats around their necks, the prevailing head-dress being a broad blue bonnet. The women's dresses were mostly all home-made, of finely spun wool, dyed a kind of blue and brown mixture, and looked not unlike common wincey. Every female wore a tartan plaid or large shawl over her head and shoulders, fastened in front by an antiquated-looking brooch, and upwards of twenty of these plaids were of the Rob Roy pattern, all got from the mainland. Several of the women wore the common white muslin cap or mutch, and only one single solitary bonnet, of a rather romantic shape, could there be descried, adorning the head of by no means the fairest-looking female present. All the men, and a few of the women, wore shoes; the rest of the women had stockings on, or went barefooted. They seemed very earnest and attentive to the discourse, and now and then heaved a long deep sigh, as if by way of response. The singing baffles description. Everybody sang at the top of his voice, and to his own tune, there being no attempt at harmony. Our coming had been anxiously expected, and many a weary look cast across the sea towards Harris, for two or three weeks preceding our arrival. At last the people began to despair, and on the Monday before we arrived three of the stoutest and hardiest men on the island set out in an open boat for the Long Island in search of seed and meal, but, owing to contrary winds, were forced back to their home on Wednesday night in a tired, worn-out condition, having unsuccessfully combated the winds and waves for three days, and at the risk of their lives. Condition of the People during Last Winter. When the factor, Mr M'Kenzie, with MacLeod's vessel, did not put in an appearance in autumn last year, as usual, the inhabitants at once began to make preparations for the winter's store. Last harvest was very bad with them, and they knew they would be short of meal; and from the first they began to husband that commodity. They also killed a number of the proprietor's sheep on the island of Soa, and salted the carcasses for their own use during winter. Whether they are expected to pay for these sheep I cannot say. The Austrians, nine in number, were wrecked on the island between the 15th and 20th of January, and were at once quartered on the inhabitants, each house taking a man or two by turns for a few days. The minister boarded three of them for the whole time, which was between five and six weeks. Such a sudden and unexpected influx to the population soon began to tell on the already not over-abundant stock of meal, and part of the corn that was reckoned upon for the spring seed had to be used for meal. Upon H.M.S. "Jackal's" arrival to take off the Austrians, about the latter end of February, the captain, hearing of the low state of their meal-barrels, sent them ashore a quantity of biscuits and the best part of a sack of meal. They speak of the Austrians as being very grateful, and content with the humblest fare; very peaceable, and anxious and willing to assist and help them in everything. From the time the Austrians left until the arrival of MacLeod's vessel in April was the period of greatest hardship, and they had to go for a week or or two without their porridge, although they had, I think, plenty of salted meat. They say they could not afford to make any bread, that their chief sustenance consisted of brew made from the flesh of the fulmar—a sea-fowl which they catch in large numbers—mixed with a handful of oatmeal. There was little or no milk to be had, none of the cows having calved. 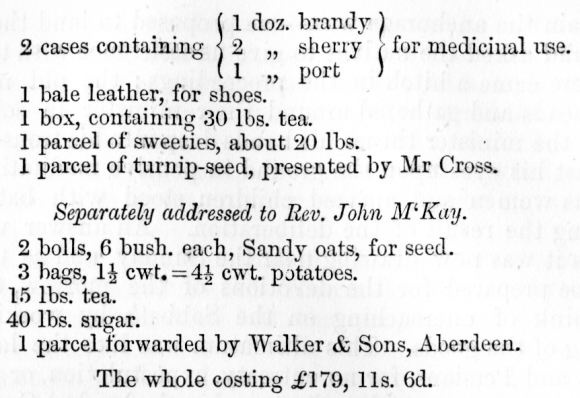 MacLeod's vessel brought them 16 bolls of seed-oats, 38 bolls of meal, and 20 barrels of potatoes. A good part of their land remained unsown (about one-third), and several patches remained unturned, as they preferred leaving it in that state until the supplies arrived, when they would know if there would be sufficient seed for all the land, besides food to serve them until autumn. Judging from outward appearance, I cannot believe the St Kildians suffered much from want of food. They are, on the whole, full-faced, fresh-looking, and some of them well-coloured and quite rosy. Several of the women are, in my opinion, more than ordinarily stout. No doubt they might be wanting in farinaceous food, and had to take more than was good for them of cured meat, which may account for some of the complaints found under "Medical Report." It may be mentioned that at this moment there are twenty carcasses of good cured mutton lying in the storehouse in two barrels for the proprietor. These were killed for him from his own flock in the island of Soa. There can be no doubt, had the St Kildians been in great want they would have used this mutton, and been made quite welcome to it by MacLeod. Of course, since the arrival of the sea-fowl in March, they have had plenty of eggs. Salt fish was very scarce with them last winter; they say the fishing season was very stormy, that they could not go out, and that on one occasion they lost the most of their lines. Dinner—Potatoes, and the flesh of the fulmar, or mutton, and occasionally fish. Supper—Porridge, when they have plenty meal. They take tea once or twice a-week, and expressed themselves as rather fond of it. They seemed surprised at the small quantity of tea sent in proportion to the amount of sugar, and there was no evidence of the partiality for sugar and sweets which has been attributed to them. Tobacco was what they invariably asked for, and among the first questions put by the minister was, if I had brought any tobacco, and when I had unfortunately to answer in the negative, I perceived he felt far from happy. Statistics of the Population, &c.
There are 18 inhabited houses on the island—16 zinc-roofed cottages, and 2 thatched huts—arranged in the form of a crescent, about 15 or 20 yards apart. They have been numbered from right to left. There are thus living on the island at present 22 grown-up men, including the minister, and 39 women; 5 boys and 4 girls under 14 and over 5 years of age; and 4 boys and 1 girl under 5 years of age—in all, 75 souls. There was one case of illegitimacy among the present inhabitants. There are about a dozen marriageable women, while there are only two unmarried men. This it must be admitted, is out of all proportion, and it would be well if some means were adopted whereby the young women could be transferred to the mainland for domestic or farm service. They would no doubt make good out-door workers or farm servants, and might be much benefited by the change, acquire cleanlier and less slovenly habits, which they would carry back with them if ever they returned. It must tell on the prosperity of the island such a large majority being females: they have to be supported, and though able and willing workers, still are unfitted for the arduous and dangerous pursuit from which the St Kildian derives his principal support. The majority of the men are old, and comparatively few young lads are ready to take their places. Intermarriages where the people are all blood-related must prove injurious, and have a debilitating tendency; and it would be well for the future physical strength of the St Kildians were the young men to find partners somewhere beyond their own little colony. The beneficial effect of this is plainly visible in the family of Malcolm M'Donald (No. 9 House), whose son and daughter are certainly the shrewdest and most managing-like that I came across. 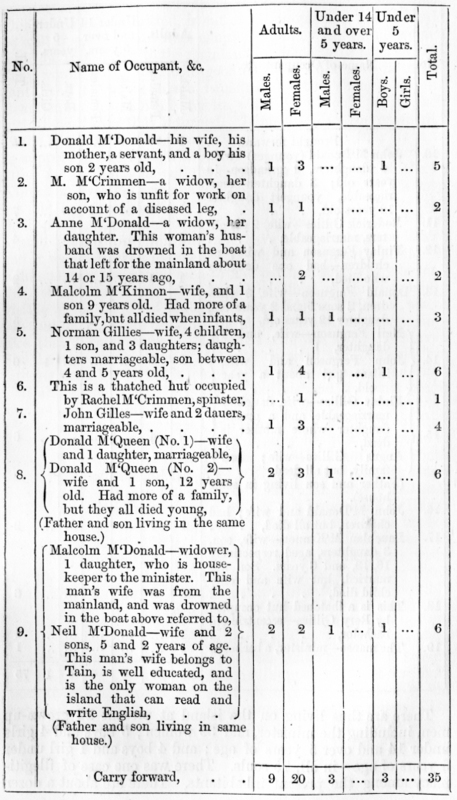 Malcolm's wife was from Lochinver. She, however, proved unfaithful, and deserted her husband, but fate overtook her in her attempt to reach the mainland, and it is said she found a watery grave. The husband does not credit this report, but believes that the occupants of the boat were picked up by a passing vessel and conveyed to a foreign country. A curious incident bearing upon this story has just now come to light. A young man said to belong to St Kilda died in South Africa, and left a small legacy of £37, which amount has found its way to the alleged father of the young man, who is still hale and hearty. Meantime another man of the same name in Harris has laid claim to the money, and maintains that it was his son who died in South Africa. A letter relative to the matter was sent to Mr M'Kay, per the "Flirt," from a minister in Harris, wishing the matter explained to the possessor of the money; and from what information could be gathered, the affair may possibly find its way into the law-courts. M'Donald's wife could talk English pretty well, and always acted as interpreter on the arrival of any strangers. She had the honour of entertaining the late Duke of Athole when he visited the island upwards of twenty years ago. It is said this nobleman supped of the brew made from the fulmar's meat, and slept all night on the floor of the hut, and vowed in the morning he never had better repose. The duke is still remembered by the older people with pleasure, and the hut that sheltered him pointed out with a feeling of pride. State of the Dwelling-Houses and other Buildings. The sixteen stone-and-lirne-built cottages were erected about fourteen years ago, and are certainly much superior to the habitations of the same class of tenants anywhere in the Western Isles. The walls are well built, with hewn stones in the corners, and are about 7 or 8 feet high; chimney on each gable; roof covered with zinc (perhaps rather flat); outside of walls well pointed over with cement, and seem none the worse as yet of the many wild wintry blasts they have withstood. Every house has two windows, nine panes of glass in each, one window on each side of door; good, well-fitting door, with lock. The interior of each house is divided into two apartments by a wooden partition, and in some a bed-closet is opposite the entrance-door. Every house I entered contained a fair assortment of domestic utensils and furniture—kitchen-dresser, with plates, bowls, &c, pots, kettles, pans, &c, wooden beds, chairs, seats, tables, tin lamps, &c., &c. There is a fireplace and vent in each end of the house, which is certainly an improvement on the majority of Highland cottars' dwellings, where the fire is often on the middle of the floor, and the smoke finds egress by the door or apertures in the wall, or it may be by a hole in the roof. The old dwelling-houses are also still kept in good repair and well thatched, and in them the cattle are housed during winter. The minister's house is neat and commodious, and is enclosed on one side by a very high wall for shelter. It is a one-storeyed building, of four apartments and a porch. In front of it is an enclosed bit of tilled land, in which some rhubarb was growing, and in which was also set a rain-gauge. Immediately behind the manse is the church—a good, substantial edifice, with four windows, and a door. The minister can enter the church by a small door on the end next his house, and which opens on a landing beside the pulpit. It has a slated roof, but no flooring; and the seats consist of plain deal benches. Two enclosed pews flank the pulpit —one for the elders, the other reserved for visitors; and there is the usual box for the precentor. A good storehouse is erected on the island, close to the landing-place. It is stone-and-lime built, and has a slated roof. This house must be very useful, and in it our supplies were to be put for division. There is another very good house, something similar in shape to the manse. It was unoccupied, and in it Mr M'Kenzie, the factor, resides during his stay when collecting the rents. Education. All read the Gaelic Bible, of which there are several copies in every house. I was told there are one or two persons on the island who can repeat the whole of the Psalms from memory. There is very little literature besides the Bible—only a few Gaelic tracts. The minister has several volumes, among which were the following: Smith's Moral Sentiments, Butler's Fifteen Sermons, Hervey's Meditations, Works of John Owen, D.D., Select Works of Dr Chalmers, Baxter's Call, Sir John Herschell's Astronomy. They all have a pretty fair idea of numbers and dates in Gaelic, and know the value of the current coins; but it cannot be said that there exists among them any great desire for money, and on offering some to the children they did not clutch at it, as children elsewhere invariably do, which may be accounted for by there being no shop where the ha'pence might be converted into something more enjoyable. There are two watches and one clock on the island. The people are fond of asking the time, and upon showing them a watch they could tell the time at once. They are anxious, and desire very much to be educated in English and arithmetic, and many earnestly beseeched that a schoolmaster might be sent to them. It is my opinion they would learn English very soon—the grown-up people as well as the young. They are very sharp and quick at picking up English names and words, and their keen, bright eyes bespeak an intellect easily susceptible of impression. Why should not a representation be made to the Highlands and Islands Committees of the Churches to give their attention to the matter, and get the St Kildians taught, at least, the simplest rudiments! Since my return I have been kindly informed by a rev. gentleman that the Ladies' Association, of which Miss Abercrombie, 7 Doune Terrace, Edinburgh, is secretary, do much for Highland education, and that an application to them might be favourably considered. Surely the expense would not be very great; and if a man could not be obtained willing to spend three or four months on the island, the minister should be requested to do the duty. Indeed, it cannot be conceived that anything could be a greater pleasure to the minister than to train up the dozen lambs of his flock in the knowledge of the English tongue and the simplest rules of arithmetic, and an acquaintance with their own situation in respect to their country, &c. Primarily, I believe, the duty of sending a teacher to St Kilda lies with the School Board of Harris. The minister, Mr John M'Kay (a native of Lochalsh, Ross-shire), is an unmarried man, between fifty and sixty years of age, of kindly disposition, fair intelligence, but far from robust-looking, and apparently rather deficient in vigour and action. I was informed that he was a long time schoolmaster at Garve, three years a probationer at Kinlochewe, five years in South Uist, some time in the island of Eig, and that from Eig he went to St Kilda, where he has been now for about eleven years. He must have much spare time, which would be profitably employed in teaching English to the young. His allowance from the Free Church is £80 per annum. Attached to the manse is about an acre of tilled land, and he keeps a cow and a few head of sheep, for which, it is to be presumed, he pays nothing. His predecessor—who is buried in the little churchyard on the island— was a Mr MacLeod, a relation of The Right Hon. Sir John M. MacLeod, K.C.S.I., the former proprietor. The men are mostly all tailors, shoemakers, and weavers; in every house there is a loom. Some of the men, attracted by the pattern of our Ulster coat, began to handle and examine it closely, when suddenly one of them, with a beaming countenance, which plainly indicated that the intricate deftness of the textile fabric had dawned upon him, exclaimed—"Dheanadh sin fhéin sud!" (we could manufacture that ourselves). As before mentioned, they make all their own clothing, and sell a good deal of blanketing and tweeds. The St Kilda tweeds are a good deal sought after for suits. A number of their sheep are blackish-brown, and when their wool is properly mixed with the white, it gives the cloth a slight brownish tinge, which is the only colouring it receives. In mostly every house there was to be seen a spinning-wheel, and a large pot, in which they dye their yarn. Strange to say, it is the men who make the women's dresses. The women are very expert at knitting. Judging from the well-built walls surrounding their patches of land, the men must be rather good masons. They have axes and hammers, and in one house there was a large box of joiner's tools. They are rather scarce of nails, which are always of use to them in the case of accidents to their boats. They had excellent candles, made from the tallow of the sheep; and suspended in the church were two chandeliers, each having three of these magnificent luminaries. Tillage and Pastoral Operations, with a Description of the Stock. About an acre and a-half, or perhaps a little more, of tilled land is held by each family, the greater part of which lies in strips between the houses and the sea, and the rest in patches behind the houses between that and the foot of the hills. The soil is a fine black loam resting on granite, and by continued careful manuring and cleaning, looks quite like a garden. Yet with all this fine fertile appearance, the return it gives is miserable; and this can only be accounted for, I presume, from the land never being allowed any rest under grass. The only crops grown are potatoes and oats, with a little bere. Within the remembrance of some of the older men, the returns were double, or nearly treble, of what they now are. Questioned several of the men upon this point, and got exactly similar answers. From a barrel of potatoes (about 2 cwt. ), scarcely 3 barrels will be lifted. They require to sow the oats very thick—at the rate of from 10 to 12 bushels to the acre, and the return is never above two and a-half times the quantity of seed sown; formerly it used to be five or six times. I was shown a sample of the oats grown, but they were very small and thin, and thick in the husk. If possible, they avoid sowing home-grown seed, as it never gives a good return. Flails are the instruments used for separating the grain from the straw. The ground is all turned over with the spade, of which they have a number in very good order. The Cas Chrom (spade-plough), so common in the Western Isles as an implement of tillage, was once in use, but has long ago given place to the spade, and not one is now employed, The land is harrowed with a sort of strong, roughly-made wooden hand-rake. They have iron grapes for spreading their manure. The dungpits are situated generally a few yards in front of the house, in the end of the patch of land, sunk a few feet in the ground,—rather convenient for being conveyed to the land, which is done by wooden creels or baskets. Saw no wheelbarrows; but there were one or two handbarrows. They have sufficient manure for their land. Sometimes they gather a little seaware for manure, but there being no beach, it is not to be got in any great quantity. There is a hand-grinding mill of the old Scotch pattern in every house. This consists of two circular granite stones, about 15 or 18 inches in diameter, laid flat upon each other. In the centre of the under one is an iron pivot, upon which the upper one is turned by grasping a wooden handle. The corn is allowed to drop into a hole in the centre of the upper stone, finds its way between the stones as the upper is kept revolving, and by the time it comes out at the edge between the stones it is supposed to be sufficiently ground. The meal makes very fair porridge and bread. The whole of the arable land is enclosed by a stone fence, and lies on a gentle slope between the bay and the foot of the hills. Noticed one or two small enclosures planted with cabbages—not this year's plants. Turnips were once grown rather successfully, but of late years they have not thriven. They may renew the experiment this season with the seed sent by Mr Cross. The pasture-land is excellent, and forms as fine a sheep-run of its size as can be seen anywhere. There are four hills or tops—Mullach Skaill, Druim Geal, Mullach Onachail, and Mullach Oshivail. The highest—Mullach Ona-chail—is 1220 feet in height. In going over the island, its grazing extent may be estimated at about one and a-half times the size of Arthur Seat and the Queen's Park, Edinburgh; it may be more or less, but, judging from observation, that is about the most approximate illustration I can give of its area. Nothing is to be seen growing naturally on the island but grass, which is said to be very nutritious, and upon which the cattle and sheep thrive remarkably well. In some parts last year's grass was lying quite thick where it had not been eaten. Passing across Druim Geal, one comes in at the top of Glen Mor, a lovely valley on the south-west side of the island. A brook runs through it, and a landing can be effected at the lower end of the glen, although the rocks look rather slippery. This glen must look beautifully green in summer. It rises with a gentle slope from the sea, and is pretty steep on one side towards Mullach Onachail. There are very few rocks or stones cropping up on the surface, and better pasturage for blackfaced sheep and Highland cattle could not be desired. The surface is yet in its original state, and quite different in appearance from the side of the hills next the cottages, where the soft green carpet is so sadly deteriorated for grazing purposes by being so lamentably hacked up for fuel. Counted 1 bull, 21 cows, and 27 young cattle on the island, all in wonderfully good condition—much better, in fact, than in many places on the mainland in this trying season. The bull, brindled in colour, is of the West Highland breed, about eight or nine years old, and by no means a bad animal. He was brought from Skye about five or six years ago, and has left a mark of improvement on the young stock. The cows are of a degenerate Highland breed, light and hardy-looking, and mostly all black in colour. The young cattle are red-and-black in colour; healthy-looking, and among them are a few well-shaped and well-coated animals, which on the mainland might fetch about £5. The average value of the young cattle cannot be put above £3, 15s. a-head—that is, on the mainland. In autumn, 1875, they received from Mr M'Kenzie, M'Leod's factor, from £2, 15s. to £3 for their young cattle—a price unprecedented with them, and which was indeed as much as they would be worth to any man intending to sell them on the mainland so as to pay the cost of transit. Mr M'Kenzie, had he come last autumn, would have got 12 young cattle, which are still on the island, and which must be deducted to arrive at the average number of cattle kept during the winter. There are between 12 and 14 calves this season, nice, lively, well-fed little beasts. It is reported that dealers from Harris have gone to St Kilda and bought the young cattle as recently as three years ago, but this requires confirmation. It was impossible to ascertain the number of sheep on the island, for none of the men questioned seemed to have any accurate idea of how many there might be, or if they had, perhaps they imagined it was the best policy to keep it dark; however, from what was to be seen in perambulating the hills, the number may be put down at over 400. There may be many more, but I do not think the number is less than that. Each family, it is said, should have between 20 and 40 sheep; but, on inquiry, it was found that some families had scarcely any at all, while others again had a good many more than the regulation number. The sheep are badly managed, and receive very little: attention. In winter they are allowed to shift for themselves, and a number are blown over the rocks in seeking shelter from the storms. Their system of sheep rearing and management is very much to be condemned. Any one having the least experience in sheep-farming would suppose that the sheep would be all held in common, and the wool and carcasses divided equally; but such is not the case: every man has his own mark, and no two of the tenants have the same number. The size of a man's flock depends very much upon how they thrive and survive the winter's storm, and whether he gives them any attention. The sheep are very wild; and though it was just after the lambing season, appeared in very good condition, and able to climb the steepest parts of the rocks. The yeld sheep are plucked about the beginning of June, and the ewes about the middle of summer. They sell neither sheep nor wool. From 2 to 5 sheep are killed by each family for the winter's supply, and the wool is made into blanketing and tweed, which they sell. They keep about 12 tups. Some blackfaced tups were brought from Skye about six or seven years ago, from the same person who supplied the bull. The breed of sheep may be called a cross between the old St Kilda breed and the blackfaced; but if fresh tups were annually introduced, they would soon be all very good blackfaced sheep. Nothing is applied to the sheep by way of smearing; and, so far as could be ascertained, they were quite free from scab and other skin-diseases common to the class. The St Kildian should be initiated in the art of clipping his sheep, for plucking must be a sort of cruelty to the animals. It is my opinion that the number of sheep might be much increased were they all turned at once into one flock, the 16 families having the same share in common, and two men appointed, whose sole duty would be to look after the sheep. There should be a fixed rent for the pasturage, and not, as at present, levied on each head of sheep. Then the people would endeavour to get as much as possible out of the pasture, and the landlord, may be, would be surer of his own also. The proprietor has between 200 and 300 sheep on the island of Soa, and between 20 and 30 of the native St Kilda breed on the island of the Dun. The latter I only saw at a distance, and they appeared of a light-brown colour. All the tups were on the Dun island, and there was not an opportunity of seeing them. The sheep are said to be very fat in autumn when killed, which may well be believed from the nature of the pasture; and the St Kilda mutton that was presented to us for dinner would favourably compare in flavour and quality with the best fed blackfaced. What is not used of the tallow for candles they sell to the factor. They had no butter on the island, and make but very little of that article of diet. Saw no vessel of the shape of a churn, and omitted to ascertain their process of butter-making. Cheese is more made, as it sells better, and in order, they say, to give it a better flavour, they milk the ewes, and mix their milk with that of the cows. There are a number of dogs on the island—in fact, too many for the number of sheep, unless they use them for some other purpose, such perhaps as catching the birds. They are collies of a kind,—certainly not pure bred,—and did not by any means look as if they had suffered from abstinence. In almost every house there was to be seen a cat, from which it is to be inferred that mice exist also. There are only two hens on the island. Within the recollection of several of the older men, a lot of ponies were kept and reared, some of the crofters having as many as four and five. I was told that upwards of thirty-five years ago a man of the name of M'Donald took a lease of the island, and there being a good price for ponies at that time, he, under the pretence that they were very destructive to the grass, got them all shipped away, and there has been none since. A pony or two might be useful in carrying home the fuel, &c.; and I would certainly suggest that a Highland bull, and half a dozen blackfaced tups, be sent to them. It would improve their stock immensely, and as the young cattle are sold annually, the keeping up of the breed is a very important matter. Such a price as they got in 1875 has opened their eyes a little to the fact that the cattle deserve a a little more attention; and it would be well to impress upon them that if they succeeded in rearing one good beast every year, it would almost pay the rent. Perhaps a few goats might find a living among the rocks, and as the people are good cragsmen, they could have no difficulty in getting at them. The skins might be of some value, and the carcass would serve for food. There are neither hares nor rabbits on the island. It is the kind of place where the latter might thrive, but I do not see that their introduction could be recommended. The weather in winter is very wild and boisterous. Snow falls, they say, pretty heavily, and buries the sheep sometimes; and the frost is occasionally severe. For each croft and house £2 is charged annually. The sheep are charged for at the rate of 9d. a head; but there was no mention about the cattle being similarly taxed. The present rents were fixed by Mr M'Raild, factor to the late proprietor; and there has been no alteration since MacLeod of MacLeod came into possession. I understand the present factor got over the books from Mr M'Raild; and the same number of sheep that were then marked against each tenant is what he pays for still. So far as could be ascertained, the number has never been raised, nor reduced, nor counted by the present factor; and it is quite possible that a man may be paying rent for 20 sheep when he has none at all, while another pays only for the same number, though the number he has may be 50. A slight investigation in this direction might have the effect perhaps of placing the whole of them, for a time at least, on a more equitable footing. This part of the rent is always paid in kind; and it is impossible to arrive at the actual value given to the proprietor. None of the men keep an account of the quantity of produce they give to the factor, and the amount of goods they take in return. They have great confidence in Mr M'Kenzie, who, they say, is just and generous, and easy to deal with, and always anxious to attend to their wants in bringing from the mainland whatever they may order or stand most in need of. I have heard it stated that between £70 and £80 is the annual revenue derived by MacLeod from the island, for which he paid £3000 about five years ago. They are never pressed for arrears; and, so far as could be made out, they are contented with their lot, and consider that they are very fairly dealt with. They are very much attached to their island home, and there is no inclination to emigrate. Of their landlord, MacLeod, they speak in the very best terms, and consider themselves very fortunate in being under his guardianship; and not one single word or expression did I hear uttered implying want of confidence or distrust in his dealings with them. As one old woman put it in Gaelic, "It would be a black day for us the day we severed ourselves from MacLeod's interest." The following was communicated to me by Mr M'Kay:—"A gentleman who visited the island lately wanted them to go to the mainland with their produce in their own boats, and cease the barter system maintained with the proprietor. When MacLeod heard of this, he expressed himself as well pleased with the proposal, and informed them he would appoint a man to take their rents in money on the mainland. At the same time, he warned them of the danger of trying the experiment with such boats as they possessed. The discussion went on, the gentleman stranger strongly recommending the change, while Mr M'Kay, the minister, pointed out the danger and risk they would expose themselves to, and warned the people of the doubtful result of dispensing with MacLeod's assistance. A written document, or, as it were, a contract between MacLeod and the people was sent to the island, calling upon all those who wished to adhere to him and the present system to give in their names. Into this contract or agreement Mr M'Kay got a clause inserted granting permission to any of the inhabitants who wished it to go to the mainland whenever it suited them, and buy and sell as pleased them. Upon this every man gave in his adherence. This was the cause of a rupture between the gentleman stranger and Mr M'Kay, and some hot words ensued." I give the above verbatim, as it was related to me on the island; and it may be taken for what it is worth. It is my opinion that, with their present boats, any attempt to reach the mainland would prove as often unsuccessful as otherwise. With a smack the difficulty might be overcome, and the danger lessened; but before they could keep a smack, something would require to be done to the landing-place, of which more anon. Perhaps it might not be out of place to suggest the idea of having a shop established in St Kilda. There is an educated woman on the island, the wife of Neil M'Donald (house No. 9); and if she were to take charge of a kind of store, and a steamer was to call twice a-year, something might be done in the way of trading. I quite failed in getting any approximation to the quantity of exports. Had I been there on a week day, I might have prevailed upon each to try and draw upon his memory and give me a list of what he gave the factor every year; but most unfortunately it was Sunday, and the people were extremely reticent. If any questions were asked them, they would either move away or tell me plainly they would not answer such inquiries on the Sabbath. The feathers of the sea-fowl appear to be the principal export, and from them the people derive the greater part of their income. The price paid by the factor for feathers is 6s. per stone of 24 lbs. for black feathers, and 5s. for grey for which, upon inquiry, I find he might receive, by selling in Edinburgh or Glasgow, from 7s. to 10s. the stone. At present there are four boats on the island. Two of them are almost new, and, though excellent boats of their kind, are scarcely strong enough built to withstand long the rough usage of having to be hauled over the rocks when landing. These boats have been presented to the St Kildians by gentlemen who visited the island. I believe that Government, on a representation by the captain of the "Jackal" (Captain Digby), is sending them another boat this year; but if like the boats carried generally by Government vessels, it will be of very little use to them. The best plan would have been for the Government to have ordered a boat to be built specially for them at Stornoway, something after the style of the herring-boats common there. The want of a proper landing-place is a great drawback to the island, and causes incalculable toil and great danger to the inhabitants. No one who has not visited St Kilda can form any idea of the great swell there is on the sea even in the absence of the slightest breeze. Captain Otter of the Royal Navy, who was for a long time stationed on the west coast, seems to have taken a great interest in this question of a landing-place; and if his proposed plan, which he had commenced, and which, had he been spared, he intended to have completed, were carried out, it certainly would be the greatest and best boon that could possibly be conferred on the inhabitants. He intended to have cleared away the rock in front, and then made a cutting into the bank to the right front of the minister's house for about 40 or 50 yards, and let the sea run in at high water. This would give them a safe landing-place and a sheltered harbour where a smack could be moored all winter. The project would not, I think, be very expensive. A good deal of the rock has been cut away already, and once this was accomplished, the cutting in to the bank would be a work which the natives themselves could perform under superintendence. The cutting would be, say from 20 to 25 feet deep, through gravel containing some large boulders. The spot where Captain Otter cut out part of the rock is the best place to land at, and although at first sight it does not appear very much different from the rest of the rocky shore, still the little that has been done, I am told, has been the means of preventing many a sad casualty just when the last step was about to be taken on shore. Should a fund ever be raised, by public subscription or otherwise, for the benefit of the St Kildians, it could never in my opinion be devoted to a better purpose than the construction of a landing-place. With a smack the inhabitants, it may be confidently asserted, could find their way to and from the mainland; and once there was a proper and safe place for the anchorage of such a vessel, there is no doubt it would soon be forthcoming. The people are, in my opinion, fearless sailors. This subject cannot be approached without a feeling of keen regret and sorrow, as it concerns more than anything else the future fitness of St Kilda as an abode for man. What the result will be if the present disastrous system is allowed to proceed is not for me to predict. A very large extent of their pasture has already been bared by the turf having been used for fuel. Slow as the process appears to be, yet with the lapse of time it will as surely work out the dire effect, and render St Kilda quite uninhabitable either for man or beast. In asking a woman who was piling dried grassy turf upon the decaying embers of what was recently a similar pile, if she did not feel sorry at reducing to ashes the best support of their cattle and sheep, she replied, "Yes; but we must have our food cooked." At best it is but a poor substitute for even peat, of which nothing worth mentioning was to be seen on the whole island. All over the hillsides, and dotting the summits almost as thick as haycocks in a hay-field, are the claits or small buildings where the turf is stored away to dry during the frosts of winter, and from which they carry it home on their backs as it may be required. These claits take the attention of strangers at once when approaching the island, and we were quite puzzled to comprehend their purpose. They are oblong in shape, built of stone, with the walls inclining inwards and covered on the top with turf, and the area which they altogether cover must extend to a good few acres. All around are scores, it might safely be said hundreds, of acres bared of what was once the finest pasture. In some parts where a little soil was left to cover the rock after the first cutting, a second coating or skin is forming—-a poor apology for the original sward. With such a ruinous yet necessary practice in operation, it is almost needless advocating an increase in the sheep stock. "St Kilda, Medical Notes.—The inhabitants are all of moderate stature (the men from 5 ft. 5 in. to 5 ft. 7½ in. ), look healthy and well-fed; but closer inspection shows the muscular development to be of rather a flabby character. The ailment par excellence is rheumatism, as might be expected from the exposed nature of their island home. This disease is common to both sexes, and in a number is attended with pain in the cardiac region, with irregular heart's action. Dyspepsia is also common; and it is noticeable that the teeth were in general short and square, as if they had been filed down. There were several cases of ear disease, and there is a tendency to scrofula. One boy had disease of the bones of the leg. Their staple food consists of oatmeal porridge and the flesh of the sea-fowl. Colds and coughs are common enough, but no case of phthisis presented itself. We saw only two cases of skin-disease (one of herpes and one of sycosis menti), and these were trifling, for nature seemed to have endowed them with very clean, smooth epidermic coverings. There is said to be great fatality among children when from 7 to 14 days old, but why was not easy to make out. We were told that the women sometimes proceeded to the mainland of Harris to be confined there and have medical attendance: whether such a journey in a small open boat is at all beneficial for a woman in an interesting situation, is at least open to doubt. The children whom we saw were all healthy-looking. The medicines which would be of most use are those for cough and rheumatism; and for the latter, strong liniments would be the most appreciated." It may be mentioned that Dr Scott supplied a number with medicines, so far as his laboratory would permit. On inquiry, I was told that some medicines are kept by the inhabitants, and that a small supply is sent annually by the proprietor, such as castor-oil, senna-leaves, salts, and some tonics. On one or two occasions they have had a call from medical men, who prescribed and gave them medicines. The last death took place in July 1876—a child 4 years of age. It is four years since an adult died—a strong young man, 28 years of age. On that occasion, a kind of epidemic must have visited the island, for about fifteen grown-up persons were bedridden at the same time, and all dangerously ill. The expertness and daring of the St Kildian in this his fond pursuit has been so much commented on by persons who have visited the island, that I regret not having had an opportunity of witnessing the natives engaged in this operation. On conversing with them upon their intrepidity in scaling and exploring the stupendous cliffs in search of sea-fowl, I could perceive that there exists among the men a great desire to excel as successful cragsmen. He is looked upon as the greatest hero who succeeds in capturing the largest number of birds at a time; and a young man was pointed out to me who, in a single night last year, bagged six hundred. On Sunday night I did not retire to rest, and at one o'clock on Monday morning turned out the natives. They were not slow in answering to the call, and immediately launched two of their boats, and commenced the operation of bringing the supplies ashore. The "Flirt" lay between two and three hundred yards out. Her boats were not used for transporting the goods being too slim-built to stand the strain of having to be hauled on to the rocks; and the assistance rendered by the crew was lowering the bags, &c, into the natives' boats. The whole of the work of landing devolved upon the St Kildians themselves, who certainly laboured earnestly and willingly. The most difficult part of the work was hauling in the boats, and at this the women gave great assistance—pulling with all their might at a rope attached to the prow of the boat. The men pushed at the stern and sides with their shoulders, the surf at every swell surging up around their legs. 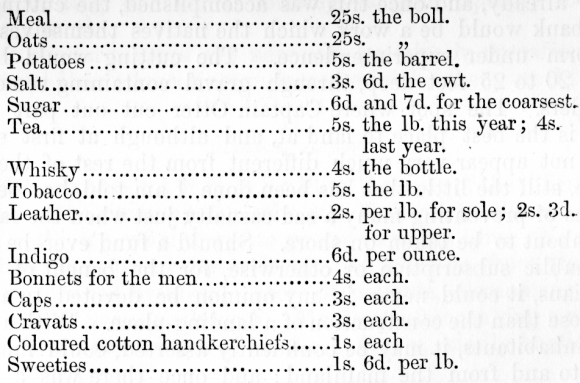 A table for the division of the goods was made out, and a copy of it left with Mr M'Kay—with an explanation that although a stated quantity was put down for each family, it was more for their guidance, and to give an approximation of the amount each was likely to receive; but that they would require to exercise their own discretion in giving where there was most need, as my time did not permit to make an investigation into the different wants of each dwelling. I have no doubt, from the friendly relations that seemed to prevail among them all, that the whole of the goods would be amicably and peaceably shared. Although the seeds in my table were equally divided, special instructions were given that those who had the most land to sow should receive more than the others. The brandy, wine, and sweeties were to be given out equally. The people themselves were to arrange about the division of the leather and horsehair. About half-past seven o'clock on Monday morning, the 14th of May, the last bag was safely landed. Anchor was immediately weighed, and in a few hours the gigantic rocks of St Kilda were lost to view, and vanished amidst the wide expanse of ocean. This fund was instituted in 1859 by the bequest of £700, £3. per cent. consols from the late Mr Charles Kelsall of Hythe, near Southampton (who died at Nice in January 1857), to the treasurer of the Society, for the purpose of purchasing such articles as in the judgment of the treasurer might be most fitting for the inhabitants of the island of St Kilda. From the wording of the will, there was some difficulty about deciding whether the treasurer of the Highland and Agricultural Society was meant, but the Vice-Chancellor recognised the validity of the Society's claim to the charge and application of the legacy. After the necessary affidavits and powers of attorney had been made and sustained, which occupied over a year, the stock was sold, and in May 1859, Messrs Connell & Hope, the Society's London Agents, remitted the proceeds, less the legacy duty and costs. The amount was lodged on deposit receipt with the Royal Bank of Scotland, and the following is an abstract of the treasurer's intromissions. 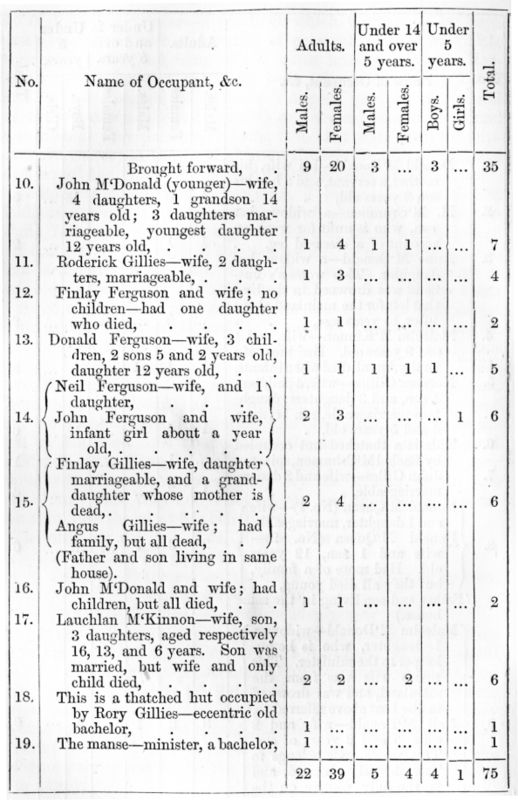 It should be added that in 1860 a subscription was raised in Glasgow and Edinburgh for the benefit of the inhabitants of St Kilda, and that a large sum (above £600) was expended on their behalf during the years 1860, 1861, 1862, and 1863; and that the £100 received from the Austrian Government per the Lord Advocate was laid out in supplies sent in 1877.